The first experiments for introducing computed tomography (CT) to coordinate metrology took place in the early 2000s. Unfortunately, the process was still much too imprecise, with measurement deviations in the range of tenths of millimeters. One early solution was the Werth Auto correction method, wherein a master part is measured using an accurate sensor and the deviations from the CT measurement are used to correct subsequent CT measurements of additional work pieces. 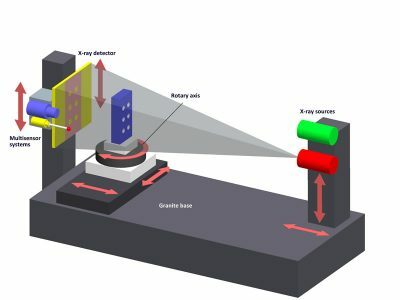 This method and the use of proven components from multisensor coordinate measuring machines enabled Werth Messtechnik to create the TomoScope® 200 in 2005, the first machine with X-ray tomography developed especially for coordinate metrology, with optional multisensor systems. This machine already had specifications and measurement uncertainties comparable to conventional coordinate metrology. „Measure completely and accurately“ was the new motto, as now for the first time all of the areas of the work piece that were difficult to access, including internal geometries, were able to be captured.